BEACHWALK Townhomes; Three bedrooms, two and a half baths, garage, private pool (shared with BeachWalk townhome guests only), private elevator, en suite Jacuzzi tub, beach view, sleeps up to eight, steps to world famous Siesta Key - Crescent Beach... and so much more... We have two units (Unit A & Unit B) at BeachWalk - ideal for larger groups, family reunions, etc. It's all about the beach, isn't it? If you have been to Crescent Beach on Siesta Key you already know why it is consistently rated one of the top beaches in the world! When you stay at one of our BeachWalk Townhouses, the powdery white sands of Crescent Beach are just across the street. These Siesta Key BeachWalk Townhouses were built in 2000. The townhouses were built for the guest who wants it all…a view of the beach and all the amenities of home - or even more! This unit has been completely renovated. The kitchen, living room and dining room are located on the second level. This level has been upgraded with modern tile flooring. The living room has overstuffed leather couch, loveseat and chair, large HDTV and has large glass sliders that open to the lanai. The lanai has a view of Siesta Beach - across the street - and table and chairs to sit and relax. The upgraded kitchen includes granite countertops and modern stainless steel appliances including glass top range/oven, microwave, dishwasher and refrigerator with through the door ice/water. The dining area is located right off the kitchen with seating for six. A card table with seating for four is located between the living and dining rooms. The main level also has a half bath with granite countertop and a full size washer/dryer. The bedrooms are on the top floor. The master bedroom has a king-size bed, walk-in closet and large HDTV. The updated en suite bathroom has a two-person Jacuzzi tub, his/hers vanities with granite countertops as well as a separate glassed in shower. The second bedroom has a queen-size bed, walk-in closet and HDTV. The third bedroom has two twin-size beds with HDTV. These bedrooms share a full bath with glassed-in shower and granite countertops. BeachWalk is located at the northern end of the Siesta Key public beach so you will be very close to a refreshment stand, a small shop selling souvenirs and t-shirts as well as bathrooms and showers. The Siesta Key public beach area also features public tennis courts and sand volleyball courts. There are lifeguards on duty during published hours. As you approach BeachWalk you will be impressed by the size of the building towering up three stories. This is important because it gives you a beach view even from across the street. The grounds at BeachWalk are covered with lush tropical landscaping. Our units at BeachWalk offer more than 1800 square feet of living space so there is plenty of room for everyone. The garage is a nice touch to keep your car out of the rain and sun. Your private elevator with service from the garage to the second and third floors is great for getting all those suitcases and groceries up to your living area. These Siesta Key Beachwalk Townhouses have a small heated pool reserved exclusively for the guests at the four Beachwalk units. You will also find a propane grill on the ground level with a table and chairs. Sunnyside Properties on Siesta Key provides all your linens, beach towels, beach chairs, ice chests, and even a wagon to help you take all your toys across the street to the beach. You will also find books, board games and puzzles. We have taken great care to supply BeachWalk with everything you need to make your vacation a memorable success. We offer a unique collection of family owned and operated premier rental units. 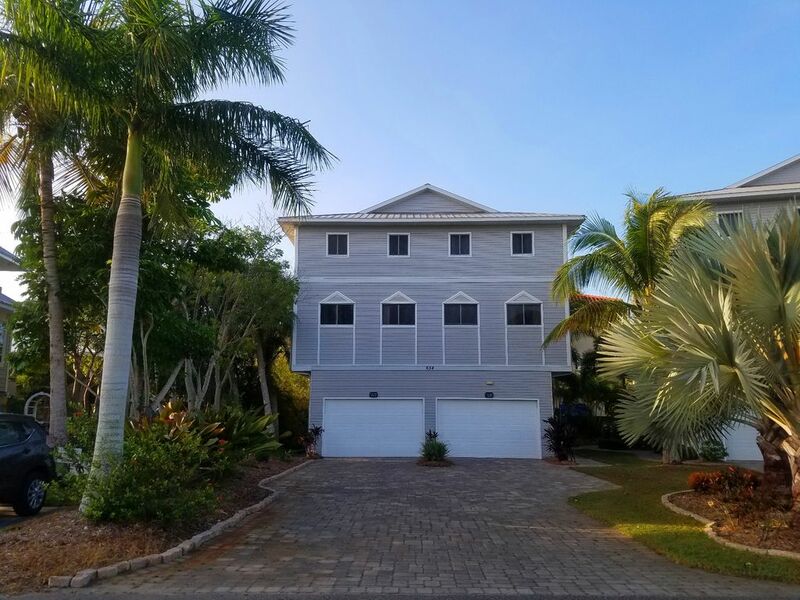 From Gulf front units on Crescent Beach and at Turtle Beach, to a townhouse across from the powder white sands of Siesta Key Public Beach, to some terrific properties in the heart of Siesta Village. One-bedroom units for a romantic getaway or 14-bedrooms for a family vacation. Key West style units, luxury beachfront condos and elegant townhomes. From the southern to the northern ends of Siesta Key and a couple in between. Whatever you need...chances are we can help! Our philosophy We provide a premier - top value vacation rental experience (from budget to luxury) on Siesta Key. Services Top shelf amenities. All of our units include, large flat panel HDTV's, Free WIFI, Heated Pool, DVD/Movie library, fully equipped kitchens, beach chairs, beach wagons (except beachfront units)... Almost all have washer/dryers in the unit. We strive to have the best equipped units on Siesta Key. This has become a family tradition! We have been coming to Beachwalk for five years now. This is a beautiful property on a quiet street and just a few minutes walk to the beach. We often take bike rides through the quiet neighborhood. Also, the pool, which is nicely shaded, provides a nice alternative to the beach. It’s a win win for this Minnesota family! Thank you for the review and for your years of return business! We appreciate you! This was our fifth year coming to Siesta Key, FL..... This is truly the best place on earth. This was our fourth time staying in this townhouse- this is a very clean, spacious, great location and most importantly any issues you have they are right there ready to help. We call it our home away from home - this will be where we stay every year until retirement and then hopefully we can buy our own place.. :) You will not regret choosing this townhouse! Thank you for your review! We appreciate it and appreciate your return business each year! This house was great because it was just a short walk to the beach and town, however we were really disappointed in the cleanliness. The check in time is not until 4pm (check out is 9am) so we assumed the place would be extremely clean. The kitchen had clearly just been wiped down with water, no smell of any kind of cleaners, we bought air fresheners to get rid of a gross smell in the kitchen. Then the fridge too was spotted with water marks. There was sand all over the stairs like they hadn’t even been vacuumed. No signs of dusting, all of the ceiling fans are caked with dust. Then the elevator in the place doesn’t stop at the second floor, it stops just before the second floor. Not safe. The other thing that was terrible was the grill. It is gas but won’t light with the button and all that was there to assist in lighting it were matches. My dad almost cinged off his eyebrows lighting it. Really dangerous if someone doesn’t know ahead of time. Two of the burners on the grill don’t work. The pool is NOT private. The ad makes it sound like it’s a private pool for your townhouse, and it is not, it’s shared by four units, and it’s behind the unit next to the one we were in. Just wasn’t impressed at all. We were expecting a fantastic place because of the reviews but, I think maintenance needs to do a lot of work. Also, almost half the light bulbs in the house are out. Upstairs bathroom has 6 bulbs over the vanity and one worked. I’d also suggest new cleaning service, she doesn’t know how to clean. We appreciate and depend heavily on guest feedback to help us keep this unit in top condition. We have addressed all of the issues identified including deep cleaning, new gas grill, elevator, etc. We’re sorry for any misunderstanding re. the pool. Our ad states that the pool is “shared with the BeachWalk townhomes only.” The owner spares no expense to try and keep this property in top shape. It is one of our most popular units as evidenced by the dozens of reviews averaging 4.8 out of 5.0!! 3 min walk to beach. 15 min walk to village (although they have free taxis if you don’t want to walk). Really nice/clean place with plenty of room and cool balcony with a beach/ocean view. We would definitely stay here again. Thanks! Thank you! We hope to have you back! Our Favorite Spot - Beach View - Love this Condo!! This condo is located a block from the beach with all the amenities. Plenty of space for a family to spread out and be comfortable. Views of the beach from the living room balcony and master bedroom windows. The master bed was SOOOO comfortable. The Village is about a 10-15 minute walk through the neighborhood. The kitchen is well equipped and roomy. A wagon and beach accessories, including sand toys, an umbrella and some beach chairs was provided. Parking allows for 3-4 vehicles depending on the vehicle size. This property is plug and play. Highly recommend!!! Thank you for leaving a review! It is appreciated!